So you’ve been doing some research on your ancestor who may or may not have served in the Civil War. You’ve consulted the Consolidated Enrollment Lists which have been digitized and made available on Ancestry.com (accessible for free in National Archives research rooms and probably at a public library near you), and found that your ancestor was in fact drafted. You’ve requested a search of the military service records and pension records held at the National Archives in Washington and no record was found. What now? Is there a way to find out why he didn’t serve? The answer may lie in extensive Civil War draft records held at the National Archives’ regional archives facilities around the country. Located in Record Group 110, Records of the Provost Marshal General’s Bureau, along with the Consolidated Enrollment Lists, are additional records related to medical waivers, deserters, and the payment of substitutes to serve in the place of draftees. The records are arranged by congressional district, and held at the regional archives facility that covers that portion of the country. In this case the “Remarks” section, which often indicates whether or not the draftee was exempted from service, was left blank. However, the volume also included a list of substitutes and the principals whom they were replacing, and he was not listed here. While I couldn’t say that this was definitive proof, I was able to tell the great-grandson that it was likely that his great-grandfather did not pay for a substitute to fight in his place. It is important to keep in mind when utilizing Record Group 110 that the records of many individual congressional districts are incomplete. They are also spread across many volumes that cover often overlapping time periods, making them difficult to research. It is important to begin your search knowing the draftee’s home town, and ideally the date he was drafted, in order to locate any additional information that might be included in the records. That being said, if these obstacles can be overcome, the Records of the Provost Marshal General’s Bureau can provide interesting insights into your ancestor’s Civil War draft experience. 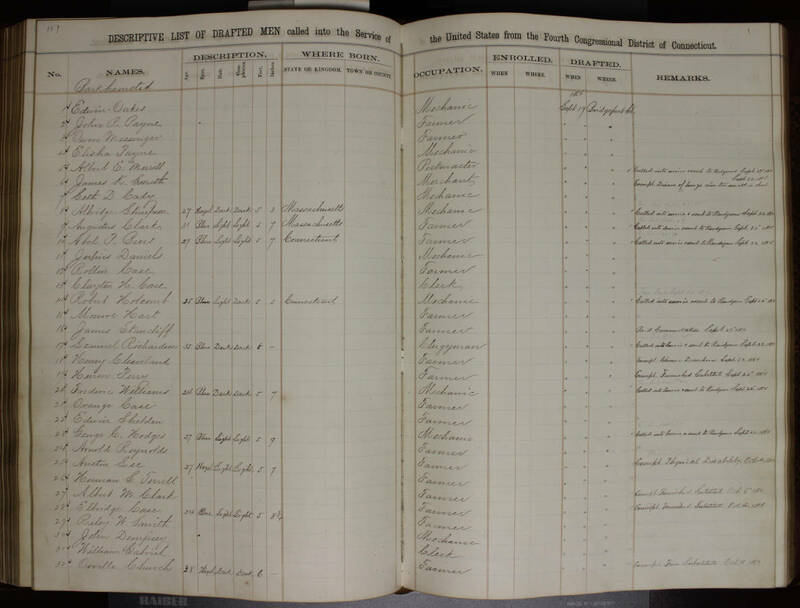 Meier, Michael T., “Civil War Draft Records: Exemptions and Enrollments.” Prologue Magazine, Vol. 26, No. 4, Winter 1994. https://www.archives.gov/publications/prologue/1994/winter/civil-war-draft-records.html.